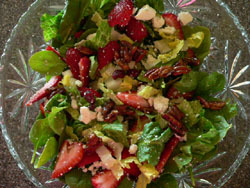 This delicious Strawberry Spinach Salad has a wonderful blend of flavors. You can use either pecan or walnut, but the pecan gives it a distinctive flavor. My sister Chris was visiting this last week and we made this salad together. Delicious with any meal. Stir brown sugar, olive oil, and balsamic vinegar in a large skillet over medium heat until sugar melts and syrup bubbles, about 3 minutes. 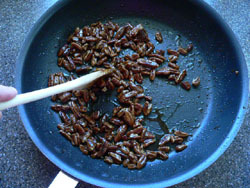 Mix in pecans and stir until nuts are toasted and syrup coats them evenly, 5-6 minutes. Cool completely on a sheet of wax paper or foil separating with a folk. Wash and spin dry spinach leafs and Romaine lettuce. If large leafs, cut them in half. Slice the Romaine lettuce. Put in nice glass salad bowl. Add Strawberries, cranberries, nuts and blue cheese. Add a Vinaigrette salad dressing of your choice and toss. Nuts can be made in advance and stored in air tight container for up to a month.